It takes courage to confront your employer, to challenge a manufacturer’s misleading labels, or to blow the whistle on fraud against the government. To succeed you need a knowledgeable, fearless guide. Halunen Law is here to lead the way. As a nationally respected plaintiffs’ law firm, representing employees, consumers, and whistleblowers across the country, our reputation precedes us into the courtroom, and our success has resulted in some of the nation’s largest financial settlements. Established in 1998 Halunen Law (originally Halunen & Associates) quickly proved to be a powerful advocate for employee, whistleblower, and consumer rights. Founding member Clayton D. Halunen’s vision, determination, and dedication led the Firm to national recognition and respect. Now, nearly 20 years later, Halunen’s team of attorneys has paved a proven path of bringing justice to the courtroom, and meaningful social change in boardrooms, lunchrooms, and locker rooms all across the country. From the initial conversation to the conclusion of your case, we’ll chart the course. We provide expert, personal guidance and help you navigate the legal process. We know it can be daunting, but be assured we’ll go to extraordinary lengths to ensure you receive the best possible outcome. I think I have a legal case. What is my first step in contacting an attorney? Halunen Law offers free consultations. One of our employment, consumer, or qui tam/ whistleblower attorneys will talk with you about the situation you are facing and whether it makes sense to explore further legal options. Call, email, or complete our online contact form today. We will do our best to get back in touch with you as quickly as possible. We realize it may be difficult for you to contact us during your work hours. If this is the case, let us know when you can be available and we will do our best to accommodate. We are always willing to find a time to speak with you, whether during your lunch or break time, in the early morning or late afternoon, or during the weekend. Is my contact with your firm kept confidential? Your free consultation and any subsequent discussions with Halunen Law are confidential. If we move forward with your case, we’ll explain how attorney-client privilege and confidentiality work within a legal proceeding. At the outset, Halunen Law offers a free initial consultation. Whether your questions can be answered in a few minutes or if the situation calls for a lengthy in-depth conversation, there is no cost to you. We are here to listen and help you identify the best next steps to address your situation. We represent most of our clients on a contingency basis. Under our contingency arrangement, you will not be charged hourly fees. We only get paid if we are successful in resolving your matter. Also, unlike most firms, we typically cover related up-front costs. Being paid on contingency means that we will be paid a percentage of what we can recover on your behalf. Costs are also deducted from any recovery. We are willing to take the risk up front because we believe in our clients and fighting for their rights. In some instances we require a small retainer, but generally the costs we front for your case, regardless of its success, are much larger. What makes your firm different from the others? Halunen Law has been at the forefront of justice and social change for the last 20 years. Our work has changed lives, corporate practices, and laws. We recognize and honor the courage it takes to challenge an employer or a major corporation, or blow the whistle on fraud committed against the government. We stand with you in pursuit of justice. Our proven process ensures our clients stay fully informed throughout the legal process and you reach the best possible outcome. While we cannot guarantee success, we have been successful in resolving about 95% of our client’s cases before having to go through a trial. We have obtained millions on behalf of our clients, including the 5th largest healthcare False Claims Act/Qui Tam settlement of $1.5 billion. We have settled many 7-figure individual cases. Although there is always a risk in litigation, we work tirelessly to ensure our clients receive the compensation they deserve. What can I expect from my Halunen Law legal team? 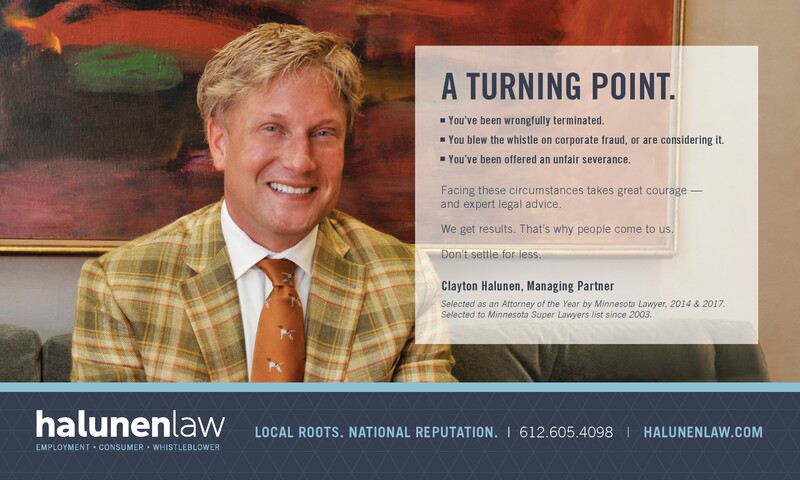 Halunen Law attorneys are fierce advocates for their clients. Tireless. Tenacious. Experienced. They have earned a reputation for success. We pride ourselves on our collaborative work environment and you will have a team of attorneys working on your behalf. Learn more about all our attorneys and what drives them to continue the fight for what’s right. Fairness. Honesty. Justice. It’s in our DNA. If it’s time to take a stand Halunen Law will stand with you every step of the way. Contact us today.